When using templates, controls cannot be added manually, reports and charts cannot be moved, and resizing options are limited. Despite these restrictions, you can add new reports and charts to existing report sets and reorder or hide certain elements. In addition to these options, you can also unlock the template, which cannot be undone. Unlocking the template grants greater control over the layout of objects on the HTML page, but you are responsible for resizing many objects and accounting for any modifications done to the page. For more information on the functionality you lose when unlocked, see How to Unlock a Template. When creating an HTML page using a template, you can right-click an existing report or chart frame and add a new report or chart to the report set. After creating an HTML page using a template, right-click an existing report or chart frame. Select Insert new report or graph before or Insert new report or graph after to insert a new report or chart frame, as shown in the following image. Depending on the option you select, a frame appears before or after the selected report or chart frame. For more information on ordering reports or charts, see How to Reorder Elements. When you create an HTML page using a template, you can right click an existing hyperlink and add a new one before or after it. After you create an HTML page using a template, right-click an existing hyperlink. 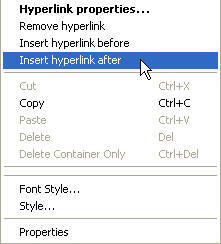 Select Insert hyperlink before or Insert hyperlink after to insert a new hyperlink. The Hyperlink Properties dialog box will appear. From the Hyperlink Properties dialog box, create a new hyperlink and select the Action, Source, Target Type, and Target/Template Name, then press OK. Depending on the option you selected in step 1, a new hyperlink will appear before or after the selected hyperlink. For more information on ordering report sets, see How to Reorder Elements. When creating an HTML page using a template, you cannot move the elements on the page, but certain elements can be reordered. Controls, tabs/report sets, and report and chart frames can all be reordered. You can reorder report sets by reordering their corresponding tabs or by selecting the report set itself and using the left and right arrow keys to move it. Select the element you wish to reorder. Note: Only controls, tabs/report sets, and report and chart frames can be reordered. Press the arrow key that corresponds to the direction you wish to move the control. The element moves one position in the desired direction. Note: You cannot leave empty spaces between elements when reordering. Note: To access these properties, the template must be unlocked, which cannot be reversed. For more information about unlocking the template, see How to Unlock a Template. When using a template to design an HTML page, certain functionality is blocked. You cannot move reports, you cannot insert additional elements, and so on. To allow the blocked functionality, you must unlock the template. Unlocking the template cannot be reversed and the developer is responsible for resizing many objects and the effects any modifications may have on the HTML page. For more information on restricted operations while designing based on a template, see Template Usage Notes. Note: By default, the Unlock button is hidden on the toolbar. The Unlock option should only be activated if there is a change that is completely necessary to the HTML page that cannot be accomplished in Template mode. Controls are no longer added to the layout automatically. The size and position of new reports and charts is no longer determined automatically. There is no option to insert report frames, hyperlinks, or report sets before/after the currently selected element. There is no option to add or delete entire report sets. Panels no longer resize automatically to accommodate new reports. It is recommended that you make a backup of your page before you unlock. Open an HTML page that was created with a template and select Options from the Window menu to open the Developer Studio Options dialog box. Select the Activate 'Unlock Template' option check box from the HTML Page tab and click OK. The Unlock button appears on the Utilities toolbar. Select the Unlock button on the Utilities toolbar, as shown in the following image. A prompt appears warning you of the changes to the HTML page once the template is unlocked. Select Yes to unlock and No to return to the locked HTML page. Note: Once a template is unlocked it cannot be locked again. Any changes made after a template is unlocked need to be maintained by the developer.